This case study recently took place in East Walpole, Massachusetts. 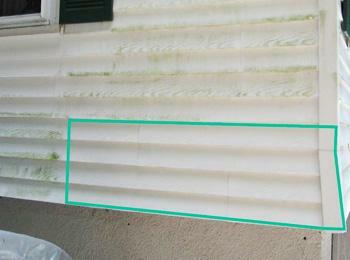 The consumer cleaned the mold and algae off the entire north facing exterior wall. However, only the lower right section of the wall was then sprayed with Endurance BioBarrier Mold Prevention Spray. The exterior wall is a PVC vinyl imprinted with a wood grain texture. The photo shown here was taken after 20 months. As you can see, the mold and algae has been regrowing on the untreated section of the wall for quite some time. But the section treated with Endurance BioBarrier looks like new! No mold. No algae. No need to hassle with re-scrubbing to remove mold and algae. This is a great example of how effective Endurance Bio Barrier Mold Prevention Spray is at inhibiting the growth of mold and even algae year-round on outside surfaces. Exposure to rain, snow, wind and sun have not diminished Endurance BioBarrier’s ability to prevent mold regrowth. Rest assured that Endurance BioBarrier will significantly outlast all competitors in the prevention of mold, mildew and germ regrowth. We guarantee it.